So my original file of a 1:17 minute video was 153mb. New file is now 3.43gb. I don't understand how rendering a video with the same resolution (1280x720) can be so much bigger than the original. Am I missing an obvious setting? Thanks for any time or attention you can give. See quick screencast below for the properties of the before and after video as well as my production settings before I rendered. Your video helped a great deal. Thanks for making and sharing it! The short answer is that your original clip contained only 175kbps of video data (0.175Mbps) which is crazy low. The output profile you produced to is 16Mbps , which is 100x higher than your source! PD didn't need to use all of that bandwidth so your produced clip shows a ~6Mbps rate. The quickest solution is to click on the "+" next to the output profile name and give the new profile a name and comment, then click on the Video tab and enter the lowest number allowed for Rate control, which is 1500. That's a little over 10x lower than the standard setting, and your new video should be much closer to the 300MB range. Thanks that was massively helpful! That brought it down to 852mb instead of 3.4gb. But it still increased it quite a bit from the original 153mb. I did another short video that shows my setting changes. I just don't understand how it can still be more when the video is actually 4 minutes shorter. Any more tweaks to share? Quote Thanks that was massively helpful! It's the bit rate. PD won't let you go any lower because normally that would result in such poor quality as to be unusable. You could try producing to WMV, but you can't alter those preset profiles. This thread has lots more info on a situation almost exactly like yours. Basically, if you're only trying to trim clips you'd be much better off using Handbrake or VirtualDub to simply cut out the unwanted pasrt and skip the whole producing part. Understood. Thank you so much for your help and the resource link. 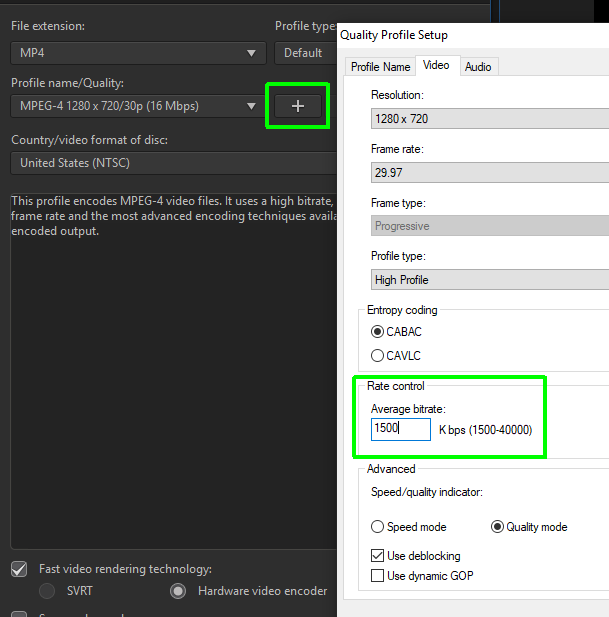 After creating your own profile (as described above) you can edit it and set lower bitrate then 1500 (there are 3 parameters there- video bitrate, max and min. video bitrate.) I use this editing for creating my own profile with 854x480 resolution (480p) and mostly for setting audio sample rate to 44,1 kHz, because Youtube transcodes 48 kHz to 44,1 kHz. Standard setting for 48 kHz: <Audio SamplesPerSec>1, for 44,1 kHz: <Audio SamplesPerSec>2 I tried this for MP4 and MPEG2. Another option: what about trying smart rendering for simple cutting of unwanted parts? But I am not sure if it works for such a low bitrate.